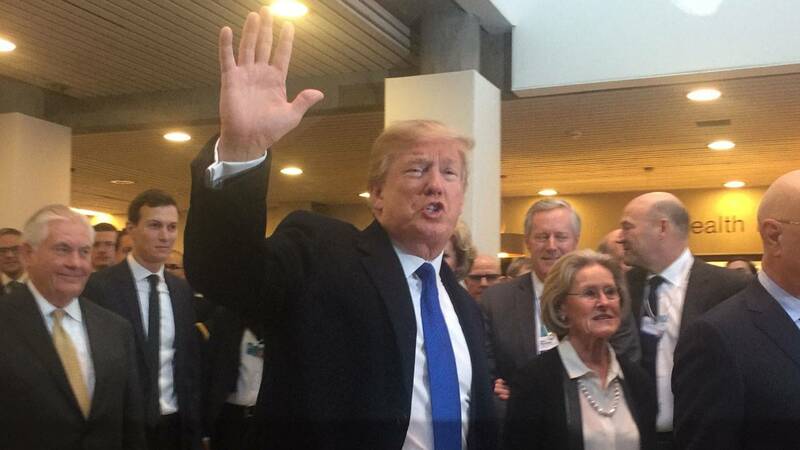 DAVOS, Switzerland (CNN) - President Donald Trump on Friday pushed his "America First" message abroad as news broke at home that he had tried to fire the special counsel investigating him. Trump did not address the bombshell report that he had tried to fire Robert Mueller, who is investigating alleged collusion between the Trump campaign and Russia for 2016 election meddling as well as possible obstruction of justice charges against the President. Instead, he stuck closely to a script that emphasized favorable conditions for making money in the United States. The President donned a salesman's hat on Friday, hailing the success from his first year in office, rather than using the platform of the World Economic Forum to rail against globalization. "There has never been a better time to do business in America," Trump said. Sounding at moments like the president of a local chamber of commerce, Trump declared "there has never been a better time to do business in America." He insisted that his "America First" governing agenda would not prevent him from negotiating bilateral trade agreements as long as they favor American interests. It was only after his speech concluded that Trump strayed from his pro-business platitudes and into the brash pronouncements about the media and Democrats that usually pepper his speeches. Deriding the "nasty, mean, and fake" news media, Trump drew boos and hisses from the crowd of global elites, a break from the otherwise polite reception he received here at the yearly summit for the world's ultra-wealthy. The President's tone was muted during much of his address, particularly compared to the booming enthusiasm he has shown on the campaign trail when railing against globalization, yet his words were upbeat. He sought to drive a hard bargain for global businesses to increase their investment in the United States. "America is roaring back and now is the time to invest in the future of America," Trump said, pointing to tax cuts, regulatory reform and new energy resources. Presidents often use foreign travel to distract from controversy back home, and in Davos, Trump sought to divert the spotlight from the developments involving special counsel Robert Mueller. But the Russia probe, which has clouded his presidency, remains front-of-mind for many in the well-read crowd here. Executives, entrepreneurs and political leaders gathered at this mountainside village had been awaiting Trump's remarks to the World Economic Forum with a sense of dread, fearing he'd use the platform to shame global elites in the same manner he railed against them during his populist presidential campaign. And while the President did tout the commercial benefits of his "America First" agenda -- a climate of competitive taxes and relaxed regulations -- he downplayed the resentments and anger that have colored his previous assessments of the global financial elite. He proclaimed that policies must be focused on improving conditions for "forgotten people," a theme he campaigned upon as a presidential candidate. "When people are forgotten, the world becomes fractured," he said. "Only by hearing and responding to the voices of the forgotten can we create a bright future that is truly shared by all." White House officials say Trump's remarks in Davos served as a prelude to elements of the President's first State of the Union address next week in Washington. An honest discussion on trade was not featured in the speech, including how withdrawing from the Trans-Pacific Partnership has left the United States on the sidelines as the role of China and other countries rise. Earlier this week, Canadian Prime Minister Justin Trudeau used his appearance at Davos to announce the finalization of the TPP agreement -- without the United States. Trump did, however, declare that his administration would consider negotiating Pacific trade agreements "either individually or perhaps as a group, if it is in the interests of all." The speech echoed the same message the President delivered personally over dinner on Thursday to a small audience of European business executives in Davos that he is trying to encourage to increase their investments in the US. The speech was a far cry from the highly critical Davos message that Trump and many campaign advisers -- like one-time chief strategist Steve Bannon -- often espoused during his bid for office. Trump and his aides anticipated a wary welcome to Davos by the businessmen and political leaders who flock annually to this snowy town. But instead of outright scorn, Trump was greeted by certain fascination when he strode into the Congress Center to begin meetings on Thursday. Flocked by camera-wielding participants, Trump declared he'd already been given a warm welcome to the summit. "This is like walking into the Academy Awards, except we have more photographers," Trump told CNBC in an interview. At a conference dedicated to global integration, Trump may not have been a natural guest, given his penchant for blasting the role of elites and the notion of free trade. But Trump checked nearly all of his criticism at the door, choosing instead to sell America and its economic strength. In a brief question-and-answer session with Klaus Schwab, the founder of the World Economic Forum, Trump said his time as a businessman prepared him for his current role on the global stage. "Being a businessman has been a great experience for me," Trump said, noting that he is the first businessman elected president without formal political experience. "I've always been very successful in making money. I'd been good at it," he said. And that, perhaps, was one of the strongest bonds Trump had with his audience, including many business titans from the United States and across the world. Despite his well-known brand name, he had never before been invited to the World Economic Forum. But on Friday as they watched and waited to take their leave, Trump left quickly for his ride on Marine One above across the Swiss Alps to Zurich and his flight aboard Air Force One to Washington.